Just checked in for the first time in a week or so. I see there are some open slots in round two still. 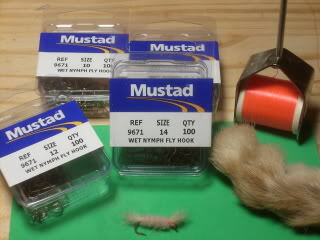 I hope they get filled, so everyone gets one of the emerging olive flys I started tying. Put me in for round two!! I will do the secret weapon emerger for round two. Great hendrickson and iso emerger pattern. his patterns for the swap. a huge favour and try it. is a favourite of mine. work no where as well as having the orange thread. deadline, I shall tie a bonus fly of Fran Betters' design. The benefit to the orange thread in the usual is that it can help represent the color of an emerging sulphur or the color of a caddis its just enigmatic enough. I participated in a NEFF swap a few swaps back and tied a usual variation that I have had great success with for selective trout and chris said it killed, so I am sure he wouldn't mind another of the usual. A rabbits foot can truly be good luck for the angler, Art Lee wrote an excellent article in fly fisherman magazine on how to tie variations of the usual. The articles name was "The Usual With a Twist". This article was published some time ago but can be found in "The Lore of Trout Fishing", so if you have read the usual on the usual check out that book. When I think of the usual I do not think of Fran Better first, but the Dette family. The few times I have had the good fortune to shop at the Dettes fly shop in Roscoe. An acquaintance of mine would clear the Dette stock of here usuals. The most productive usuals were by far the ones that my acquaintance referred to as theblueusual. In one day I saw that fly take 5 + fish over eighteen inches in one spot. Alright, Let's shut down #2 & get to work. Tie 12 flies. Mail Date is JANUARY 29. That gives swap two, 6 weeks to work same as swap one. Cool with me. Lots of time is good. Nothin' like a good swapmeister. i would like to join in one of these after christmas... Kind of a while after cuz thats when i will start tying. That date works for me. I'm just about done with my flies for the swap anyway. 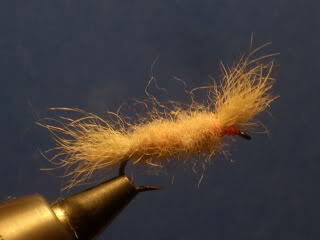 Just finnished tying the emerging olive things, and will try to get them toe tagged and in the mail this week. When we get closer to the mail in date I will post the recepie for the fly. If your address has not change since you last swapmeistered, I still have it and will send them there. If round 2 is not full, please add me to that!